For me, one of the biggest pleasures of being a mother is reading bedtime stories. As I snuggle in each night with my youngest child, I often find myself re-reading old favorites – The Very Hungry Caterpillar, the Gruffalo, Frog and Toad. And I often find myself inspired, transported, bewitched, not just by good stories, but by captivating illustrations. 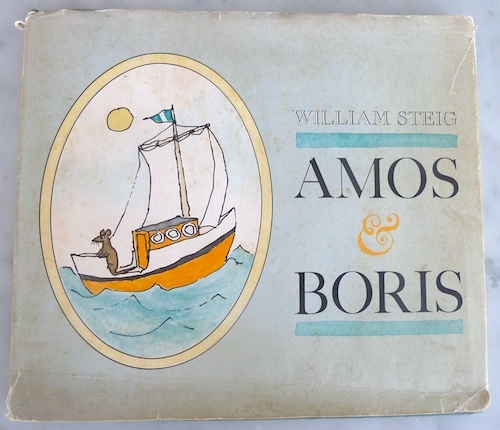 One such inspiring book is Amos and Boris by William Steig. It tells the story of a friendship between a whale and a mouse and the illustrations are loose and alive, emotive and humorous, absorbing and appealing. I know this story so well now, that I read the words aloud without comprehension, while my mind dwells on the images, roaming over the rooftops of a castle on the horizon, basking in light shining from a boat’s cabin, floating in the swells of the ocean. 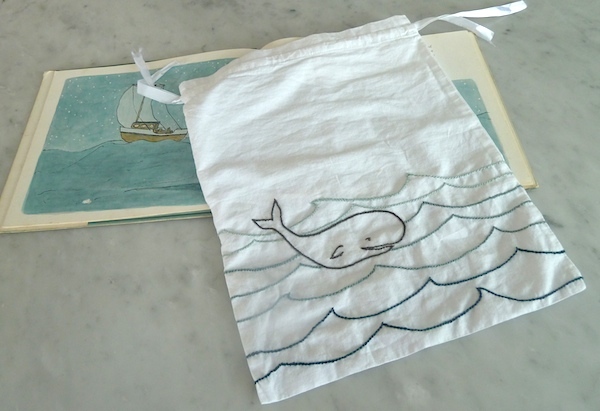 My whale, outlined in a split stitch, seems a bit washed out compared to William Steig’s beautiful illustrations. When I am a more experienced and more confident embroiderer, I’ll have to revisit this project and try filling and shading the whale with stitches. 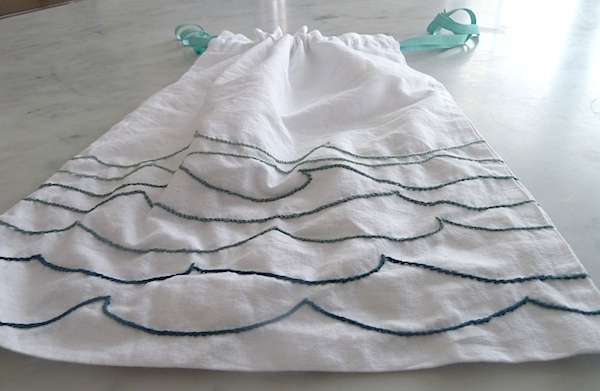 At the edges, I extended the ocean waves (stem stitch) around the side seams of the bag and across the back too. This reverse side might just be my favorite part of the project. 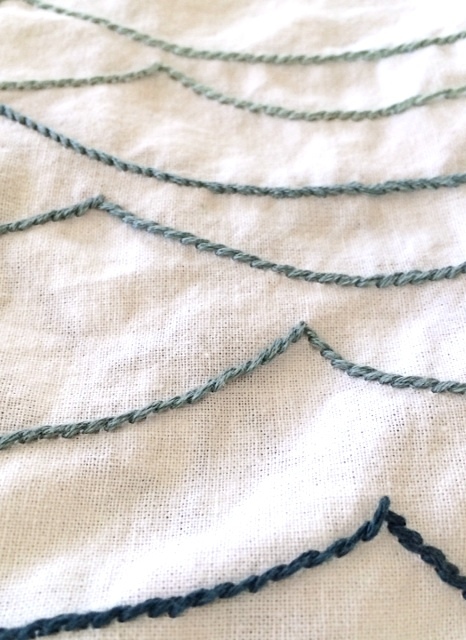 The open blue ocean, embroidered version. Your bag is adorable! Such a clever idea. Well thank you so much, Sharon. Now I jsut have to figure out what I can use it for. Oh what a cute project Elizabeth! You did a great job with the design. The whale is super cute. I think your embroidery is fantastic. Thanks so much, Martha. Glad to know you like the whale… I did have some misgivings about it. Wow. This is gorgeous! It’s be a fantastic pillowcase dress!!! Yes it would be! As a mother of boys, thats a project in which I’m not that well versed, btu I do have some young nieces. I might have to look into it! Thanks so much, Joan. I was wondering who would notice that! The book dates from my husband’s childhood (though its still in print) but for some reason I am the one who loves it like I’ve known it forever. Well, thank you, Catherine. The illustration in the book certainly has has a LOT of character and I was hoping to capture some of it, so its gratifying to have you mention it. Thanks also for reading, commenting, and hosting the link up – it really is great fun! That whale is just perfect. 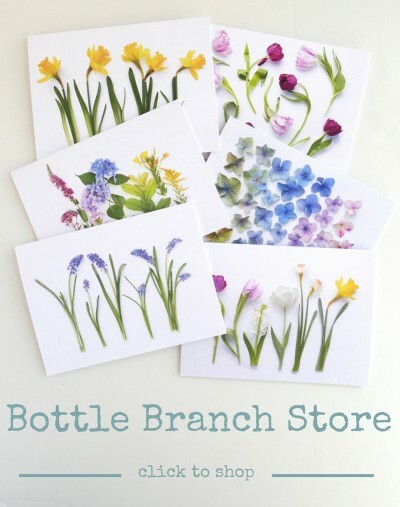 What a great little project. Thanks, Kate. It was a lot of fun! Terrific blues. And anything by William Steig is terrific. When I taught fourth grade ya classes loved Abel’s Island (short novel) as a read-aloud. Thanks so much, Cynthia. Nice to meet another fan of William Steig. I’ll have to look for Abel’s Island – its one I haven’t read yet. Beautiful work! Delicate and strong at the same time! Lovely.